Former Port Isabel Tarpon student/athlete Joseph Ian Torres has made it through his first semester at the University of Houston, and is home for the holidays. Torres recently sat down with the Press and talked about athletic and academic life at the next level. “It took me a while to adjust,” Torres told the Press. “It didn’t help that there was a hurricane (Harvey) in that area. There was a lot of flooding, but on campus the power remained on and the internet was up,” he said. Scheduling and time management are the keys to success at the college level, and Torres said he learned a lot this first semester about how to balance academics and athletics. Torres graduated from Port Isabel High School last spring. He was All-District 16-4A Div. II as a football lineman for his senior season of 2016. He also was the gold medalist in the shot put at last spring’s district meet, and placed 7th at the state meet May. 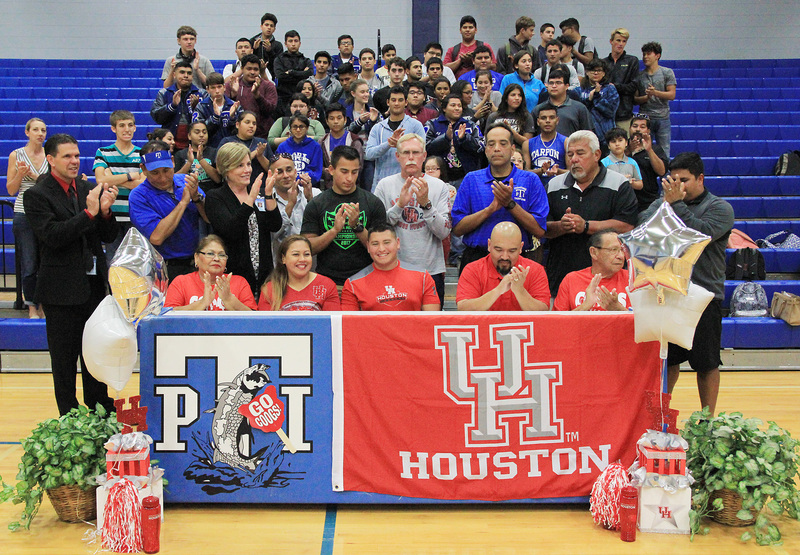 As a Houston Cougar Torres will be competing in the hammer throw in addition to the shot put, and he talked about the importance of weight training.